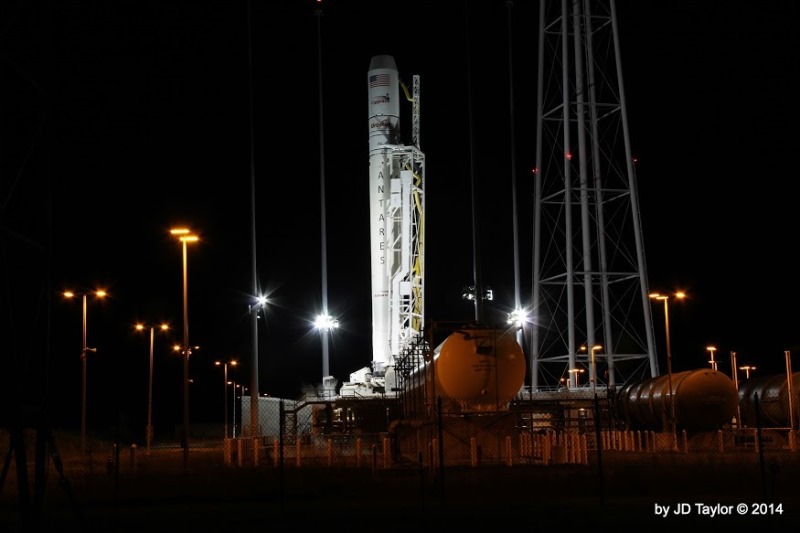 WALLOPS FLIGHT FACILITY, Va — On Tuesday, Oct. 28, Orbital Sciences Corporation (Orbital ) suffered the loss of one of the Dulles, Virginia-based firm’s Antares launch vehicles, along with the SS Deke Slayton, Cygnus, spacecraft at 6:22 p.m. EDT (1822 GMT). The anomaly happened within the first minute of flight, which left the launch pad covered in fire, smoke, and the rocket’s remnants. At the time of ignition, the launch team was not tracking any technical issues. It is unclear at present what impact this will have on the $1.9 billion Commercial Resupply Services contract that Orbital has with NASA, although NASA has confirmed that some reimbursement is built into the contract for Orbital and the on-board hardware. Shortly after the incident, the Space Agency confirmed that no personnel has been injured and everyone was accounted for. The damage is limited to the launch pad and the facilities including property and vehicles. Orbital has stated that the damage was restricted to the south end of Wallops Island. Fire teams are in place to secure the perimeter of the crash, which is a little over 8500 feet. NASA, Orbital, and the Mid-Atlantic Regional Spaceport (MARS) are working together to determine the cause of the problem and are collecting data. Orbital will take the lead in the upcoming investigation. They are currently working on contingency operations and the FAA operations center has been notified. The team is working to secure the pad as well as sensitive security materials that the Cygnus spacecraft was carrying at the time. The video of the accident suggests that Pad-0A – is likely heavily damaged and will need large portions of it rebuilt. Pad-0A is the only launch facility currently certified to launch the Antares booster and it will be Orbital’s top priority to get the pad here on Wallops Island into working order as soon as possible. Despite this accident, it is not expected to impact tomorrow’s early-morning launch of a Russian Progress spacecraft – which is also bound for the International Space Station (ISS). At present, it is unclear, what if any, impact it will have on the planned launch of a United Launch Alliance Atlas V 401 rocket with its payload of the GPS IIF8 navigational satellite. That flight is slated to liftoff at 1:21 p.m. EDT (1721 GMT) from Cape Canaveral Air Force Station’s Space Launch Complex 41 in Florida. For their part, Orbital representatives stated that accidents such as this are part of the business of spaceflight. “We’ve all seen this happen in this business before, and we’ve all seen teams recover. We will do the same,” Culbertson said, a former astronaut and International Space Station resident. 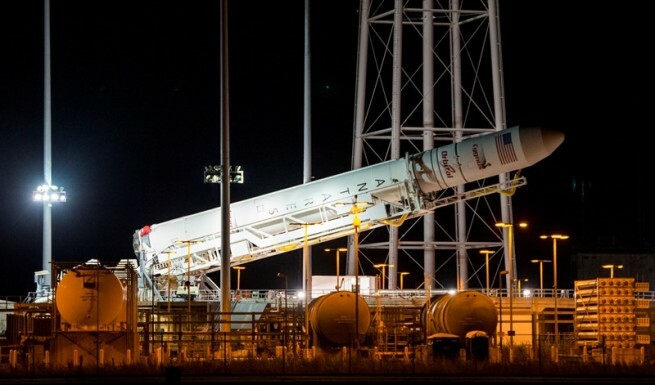 Culbertson stated that it is unclear at this time how long it will be before Antares is returned to flight, but emphasized that it will absolutely not fly until the cause of the incident is determined. At present, it is not known if either of Antares’ AJ-26 engines might be the cause of the accident. In May of this year, an Aerojet Rocketdyne AJ-26 rocket engine, produced by the Kuznetsov Design Bureau, failed on a test stand at NASA’s Stennis Space Center in Mississippi. Aerojet Rocketdyne purchased more than forty of the NK-33 engines in the 1990′s and Orbital has purchased 20 of those engines for use on Antares. Aerojet Rocketdyne has upgraded the engines by adding, among other items, electronics and a gimbaling / steering capability. it was also recently reported that Orbital is seeking other engines for use on Antares. The AJ-26 has experienced one prior failure, in June of 2011, when an engine caught fire in the same E-1 Test Stand as the May 2014 accident. The 2011 failure was determined to be caused by a fuel leak resulting from “stress corrosion cracking of the 40-year old metal” contained in the engine. Under the CRS contract that Orbital has with NASA, the company is required to launch eight cargo resupply missions to the International Space Station. NASA is currently in negotiations with Orbital to have the contract extended – and has asked for proposals (due in Nov. 2014) for the next phase of the agency’s effort to send cargo to the station. NASA is currently working to cede responsibility of ferrying cargo and crews to the ISS to commercial firms such as Orbital and SpaceX. The first commercial crew flights are scheduled to begin in 2017. Tonight’s Antares and Cygnus duo cost about $200 million, which does not include property damage or payload contents. Luckily, Orbital does have insurance. NASA has stated that the loss of the Cygnus cargo vessel should not affect operations on the station as the orbiting laboratory is, at present, well stocked with supplies – with enough on orbit to last the Expedition 41 crew until March of next year if necessary. The next United States resupply flight to the station – will be the launch of SpaceX’s Falcon 9 v1.1 rocket with its Dragon spacecraft – that launch is currently slated to occur no-earlier-than Dec. 9. Due to tonight’s anomaly, there may be a few items exchanged on Dragon’s current payload manifest, including a oxygen tank that may be switched for a nitrogen tank similar to the one Cygnus was carrying. Culbertson stressed that anyone coming across debris from the rocket – should not touch it and contact local authorities so that it can be collected. NASA’s Michael Suffredini noted that the fact there is more than one contributor on NASA’s CRS program – is a strength – as it means that when a mishap such as this takes place, the Space Agency can turn to a different, non-related, set of launch vehicles and spacecraft. It is estimated that Orbital and the incident team will need at least a few weeks in order to thoroughly evaluate the situation and to work on a plan for what is to come. At day break tomorrow, teams from the Accident Investigation Board will be sent off to locate and tag any debris and to further assess the extent of the damage. The next step is to study the video footage as well as telemetry data, which are currently in lock down. I am so thankful, as is the rest of the old gang here at KSC, that none of the team members were injured. Hope you guys can recover quickly. I’d like to know what the sensitive security materials that the Cygnus spacecraft was carrying at the time, and what the payload was for this mission?? Thanks! I hate to be critical at this point in time,,but, if the engines were involved, arent we dealing with a failure in US space policy,,,,,,,why are we still depending on Russian technology to move forward? The last few administations have shown a total lack of imagination in pushing US industry to move forward in developing new space technologies…….Were do we go from here? I believe the security sensitive material is thought to be related to the range safety equipment, and not actual cargo bound for the ISS. Regardless, rockets are tricky. How do we know something wasn’t overlooked…. The workers at Orbital are mandated to work 10, 12 or more hours a day, 6 sometimes 7 days a week, for weeks on end. It has been proven that when you work your employees under these kind of conditions, things go unnoticed, things get overlooked. This is a huge factor and why isn’t NASA enforcing their work rule policy on Orbital or Space x. Also, why is NASA putting Orbital in charge of the investigation ? this is like putting the fox in charge of the hen house. NASA isn’t in charge of the investigation. The NTSB has jurisdiction. Regardless, Orbital’s personnel are the best qualified to find out what went wrong, but ultimately the NTSB will be in charge. 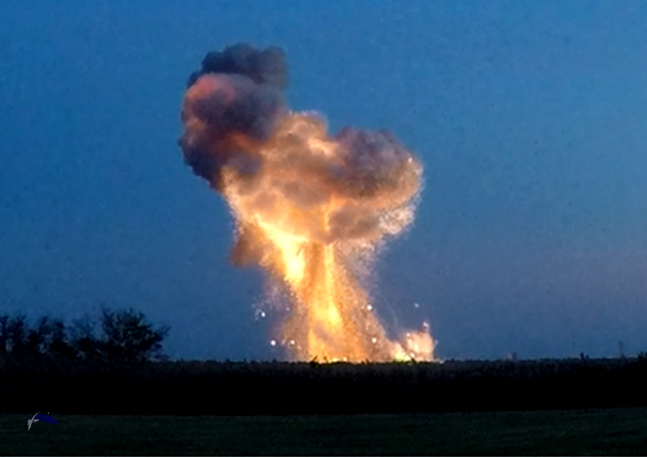 As expected, on the national nightly news television broadcast it was repeatedly stated, “A NASA rocket exploded at Wallops Island,” not “A Orbital Science Corporation Antares rocket exploded at Wallops Island.” Perhaps the general public doesn’t draw neat distinctions between NASA and commercial entities, it’s all “the space program”. The CRS contract with Orbital was 1.9 billion for 8 launches of the Antares/Cygnus combo. That equals 237.5 million per flight for hardware. NASA, Orbital, Wallops, Virginia, and insurance companies will all be kicking in to clean it up and get them back to launching. Failures happen … we learn, we fix, we improve, we innovate, we move on. A couple weeks ago, three semi trucks/trailers, each carrying about the same amount of cargo crashed in indiana. Didn’t make national news at all. We should be launching so often that this cargo crash isn’t that big a deal. The NBC Nightly News today went into greater detail about the explosion in it’s lead off story. 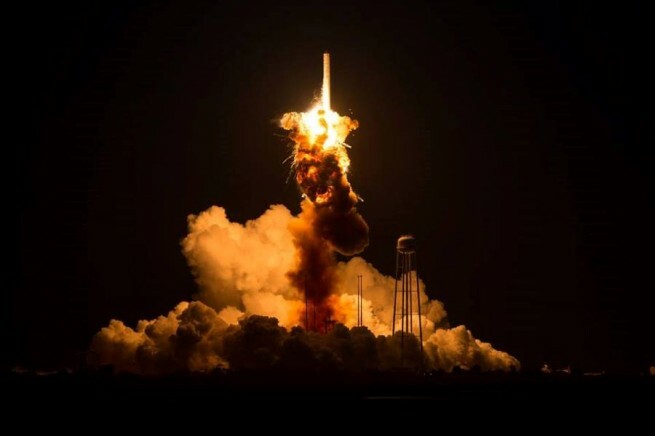 It was reported that it was an Orbital Sciences Corporation Antares rocket. It was also reported that there would be no shortages on the ISS, and that a Russian Progress transport is on it’s way. It was further reported on NBC that Musk stated that the upgraded NK-33 engines “were a joke”. Hence my issue with Space X. Musk has a tiger by the tail, but he still feels the need to gloat and trash talk the competition. Pride cometh before the fall; maybe Elon would be whistling a different tune if it was one of his F9s smouldering on the ground. New spacers like the arrogance, but the legacy people who’ve been in the game for decades aren’t impressed. Musk made that comment YEARS ago NOT after the crash. “Musk: I tend to approach things from a physics framework. And physics teaches you to reason from first principles rather than by analogy. So I said, OK, let’s look at the first principles. What is a rocket made of? Aerospace-grade aluminum alloys, plus some titanium, copper, and carbon fiber. And then I asked, what is the value of those materials on the commodity market? It turned out that the materials cost of a rocket was around 2 percent of the typical price—which is a crazy ratio for a large mechanical product. Musk: One is the incredible aversion to risk within big aerospace firms. Even if better technology is available, they’re still using legacy components, often ones that were developed in the 1960s. Anderson: That’s a nice phrase. Musk: The results are pretty crazy. One of our competitors, Orbital Sciences, has a contract to resupply the International Space Station, and their rocket honestly sounds like the punch line to a joke. It uses Russian rocket engines that were made in the ’60s. I don’t mean their design is from the ’60s—I mean they start with engines that were literally made in the ’60s and, like, packed away in Siberia somewhere. Anderson: Where else are there inefficiencies? The Daily Launch of the AIAA reported on 29 October that on the NBC Nightly News with Brian Williams reporter Tom Costello stated, “some like SpaceX CEO Elon Musk called the engine “a joke”. There was no citation of a 2012 interview. 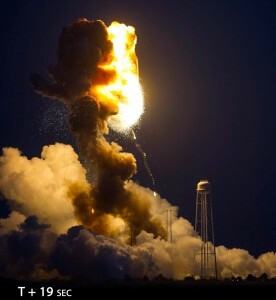 Even if the statement was not made immediately after the Antares explosion, the statement that “their rocket honestly sounds like a punch line to a joke” does, as stated by Michael J. Listner, smack of “arrogance”. If SpaceX should suffer such an explosion, Newspacers would probably howl with indignation if anyone dared call a Falcon “punch line to a joke”. Such statements can only serve to denigrate the opinion of the general public about “rocket scientists” and space exploration. In the context of “new” cutting edge technology for the space program then utilizing old engines, and outsourcing the tankage to the Ukraine and then charging 100 million more per launch, to me sounds like Musk was EXACTLY spot on. Perhaps regardless of the facts, we selectively hear what we want to hear, and if you want to believe in Musk you are certainly free to do so. We did not hear anyone from Orbital Sciences calling Musk’s Falcons “a joke” when his “cutting edge technology” didn’t work very well until NASA engineers helped him with his fuel slosh and staging problems. With that, you are welcome to have the last word. Congratulations.